Four diseases have broken out in the world and it is up to a team of specialists in various fields to find cures for these diseases before mankind is wiped out. Players must work together playing to their characters’ strengths and planning their strategy of eradication before the diseases overwhelm the world with ever-increasing outbreaks. For example the Operation Specialist can build research stations which are needed to find cures for the diseases. The Scientist needs only 4 cards of a particular disease to cure it instead of the normal 5. But the diseases are out breaking fast and time is running out: the team must try to stem the tide of infection in diseased areas while also towards cures. A truly cooperative game where you all win or you all lose.As skilled members of a disease-fighting team you must keep four deadly diseases at bay while discovering their cures. You and your teammates will travel across the globe treating infections while finding resources for cures. The clock is ticking as outbreaks and epidemics fuel the spreading plagues and you must work as a team to succeed. Can you find all four cures in time? The fate of humanity is in your hands! 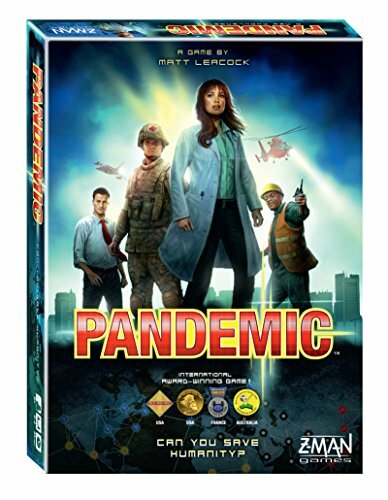 The 2013 edition of Pandemic includes two new characters ? the Contingency Planner and the Quarantine Specialist ? not available in earlier editions of the game.